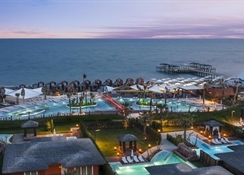 Enjoying an enviable seafront location in Belek, Antalya in Turkey, the 5-star, all-inclusive Riu Kaya Palazzo Golf Resort is set directly on the beach and is surrounded by beautiful gardens. With the golden sandy beach on your doorstep, the hotel offers marvellous views of the Mediterranean Sea. The contemporary designed hotel consists of a clutch of stylishly decorated rooms and suites that feature all modern amenities. The hotel’s buffet and themed a la carte restaurants serve up a wide variety of dishes to indulge your palate. There’s a lot of activities and entertainment options to keep you engaged from dawn to dusk. Choose from table tennis, mini golf, volleyball, soccer, aerobics, canoeing and other water sports in the surrounding area, or if you’re a golf enthusiast, tee off at the nearby 18-hole Golf Kaya Palazzo club. For relaxation, there are two fresh water swimming pools, an indoor pool, sauna, Jacuzzi, Turkish bath and spa with an array of treatments and massages. The young guests can make a splash at the kids’ pool, let off steam on the children’s playground or enjoy endless hours of fun at the mini club. 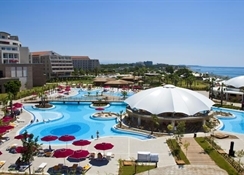 Located 6 km from the Belek town centre, Riu Kaya Palazzo Golf Resort enjoys a serene beachfront setting. It is 2.5 km from centre of Kadriye and only 200 metres from the Kaya Palazzo golf course. 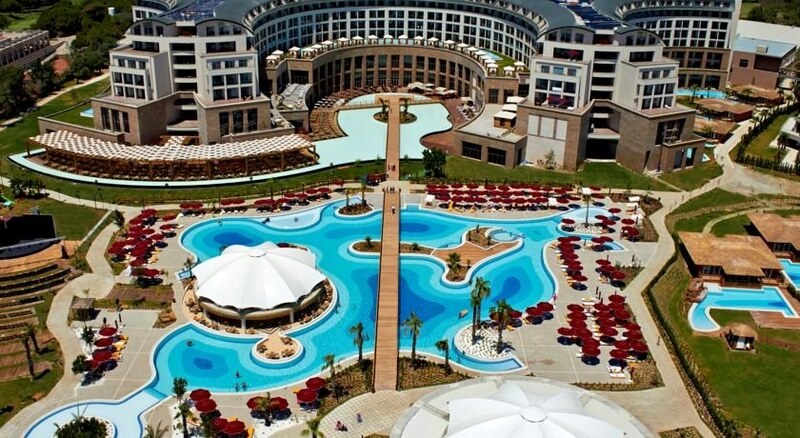 The hotel’s privileged location makes it conveniently accessible from the major attractions of Belek and Antalya. 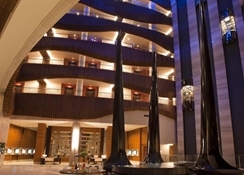 The Antalya Airport is 27 km away and a taxi rank is available in front of the hotel. Amid expansive lush gardens, the 5-storeyed Riu Kaya Palazzo Golf Resort houses 506 neatly appointed spacious guest rooms, all of which come fitted with modern furnishings and necessary amenities. The rooms are divided into Double Rooms and Suites. The only difference between the two is that Double Rooms feature a sitting area mostly with sofa or sofa bed, while Suites have a separate lounge with sofa and table. The common amenities across all categories of rooms include balcony or terrace, safe (additional charge), satellite TV, minibar, kettle, air conditioning/heating, Wi-Fi (additional charge), telephone, parquet floor, en-suite bathrooms with bathrobe and slippers, bathroom toiletries and hairdryer. The minibar in the rooms are regularly replenished with water and soft drinks. Some of the rooms offer scenic views of the sea or garden depending on their location. Dining options at Riu Kaya Palazzo Golf Resort, Belek include a first-rate buffet restaurant serving breakfast, lunch and dinner, with live cooking for guests. There are themed dinners three times a week. The hotel also features a la carte dining choices in the form of three themed restaurants – Turkish/barbecue, Asian and Italian. It is mandatory for guests to wear formals during dinner, which includes long trousers for men. Unlimited local and a selection of international alcoholic and non-alcoholic drinks are available at the hotel’s bars, restaurants and the disco. The lobby bar offers snacks and beverages during night, or you can prefer having your favourite cocktail at the hotel’s poolside bar or the beach bar. Guests can also opt for the all-inclusive programme that includes meals and a lot more extras. 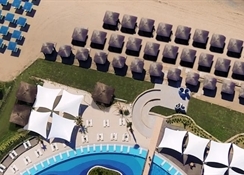 There are 2 swimming pools for adults with free sun loungers, towels and parasols by the pool, as well as a children’s swimming pool with 5 water slides. The relaxation factor of the hotel is enhanced by the on-site spa that offers a variety of treatments, massages, Turkish bath and sauna. There are beauty salon and hairdresser (additional charge) for grooming yourself, as well as a fully equipped gym for the fitness lovers. If you’re a sports enthusiast, you can enjoy beach volleyball, water gymnastics, aerobic, darts, canoeing, pedaloes, tennis, billiards and water sports like windsurfing, catamaran, diving and water skiing. The 18-hole Kaya Palazzo golf course is just 200 metres away from the hotel. For junior guests, the hotel has fun daytime entertainment programme every day at the kids’ club RiuLand, along with daytime entertainment activities for adults too. In the evening, guests can dance to the pumping beats at the discotheque or enjoy shows and live music.